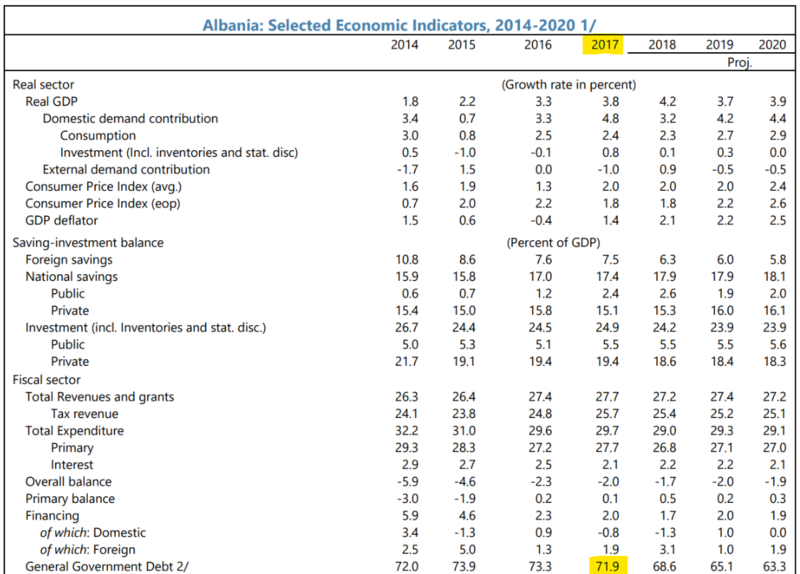 The IMF released today its quasi-annual Article IV country report for Albania, a document which provides their evaluation of the macro-economic situation for the country along with a list of policy advice. The document has become an important reference point for the economic discussions in the country as it is seen as one of the few official reports which is prepared outside of the government’s control. It is worth stressing though that this is somewhat of a local overrating – the IMF rarely, if ever, completely contradicts the government’s positions as it is the official partner with which it collaborates. This is what makes this report especially interesting. 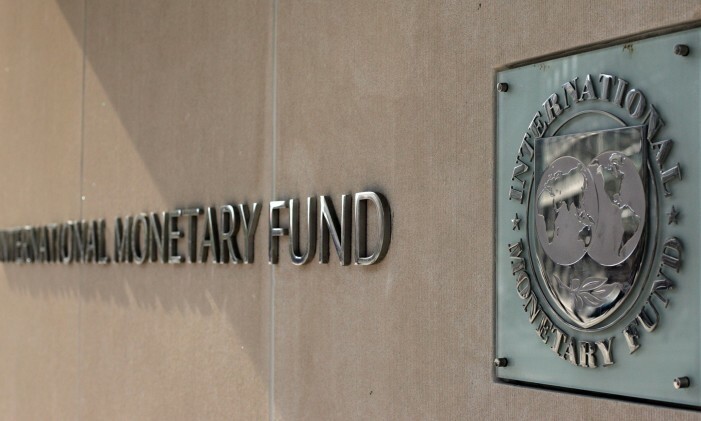 Among a number of concerns raised, the IMF has made a bold statement which it rarely does: it has refused to endorse the statistics published by the Government regarding the public debt figure. As I wrote a few weeks back, the KLSh report on the 2017 budget claimed that through mismanagement of the public procurement process the government had a created a list of arrears, VAT-refund obligations, and other unpaid commitments which suggested that the actual public debt was 72% of GDP instead of the 69% that the government was claiming. More than a simple accounting mistake, the report suggested that this happened due to a series of legal violations which were never supposed to occur anymore. The IMF, without explicitly stating it, has endorsed the KLSh figure. In doing so, it has affirmed that the Government has created arrears close to €200 million. It has also re-affirmed, just as the KLSh report has, that the much-heralded “energy sector reform” has practically failed and the government support for the sector’s obligations continue – another cause of the government’s inability to reduce the debt figures in a nominally growing economy. Beyond the quite obvious refusal of the government’s public debt statistics, which theoretically should lead to some investigation, there are two further issues worth mentioning. First, the Albanian Investment Corporation (ATRAKO) is real, and the government seems quite willing to push ahead with it. The IMF claims, in page 19 of the report, that the institution is somewhat of a “development bank,” and that the government should be aware of the risks associated with it in developing countries – i.e., it mostly uses public money to finance failed projects. However, ATRAKO is not a development bank. One might speculate as to whether the government has hidden its true purpose, or whether the IMF has not been able to grasp its objective, but the new institution goes much further than this. A development bank is used to fund projects in the developing world that would not obtain funding from the formal banking sector – mostly due to the high informality that is associated with small firms in these countries. Their usefulness is a continued topic of research; however, they usually aim to formalize and grow sectors of the economy that have remained undeveloped. ATRAKO does not claim to aim at a similar objective. Its objective is to use public properties and assets to attract “strategic investments.” It will quite clearly not work with smaller firms and enterprises, but with large ones that are able to plan projects on a grand scale. In Albania, unfortunately, there are a number of precedents of such laws being used for extremely sinister objectives. The law on strategic investments, the unsolicited requests for public–private partnerships, “special laws” such as the ones for the National Theater or the Vlora Airport, have all been cases of the public interest being undermined. While the IMF has every right to urge caution regarding the Albanian Investment Corporation, it is worth re-stressing that it has probably not been made fully aware of all the worrying implications that arise from this new institution. Second, and this is now a quite familiar tune, the IMF is increasingly worried regarding the continued usage of public–private partnerships. Once again, it claims that the government has no capacity to measure and manage the risks that arise from these contracts, and that their continued usage has become a fiscal burden. This once again raises the familiar concern that our public debt is actually higher even than the 72% ratio if these contracts became part of public accounting. Most importantly though, the IMF warns that far from stopping these contracts as it has publicly proclaimed recently, the government is planning a new massive wave in 2019. According to IMF estimates, the new plans, for this year alone, are close to 15% of GDP, i.e., close to €1.8 billion! While not all of this figure should be considered as a hidden debt, as this might include private investment which the public is not obligated to repay, it is still a staggering figure. Yet, once again, it seems like the government is completely refuting these policy suggestions and the Albanian economy is headed towards a number of worrying developments.